On 10 August 2015, an unassuming product expert who learnt his ropes at IIT Kharagpur was declared the next CEO of tech giant Google. Sundar Pichai's appointment was hardly an unexpected one. Pichai is a man known as much for his veritable Midas touch with every product he has developed for Google – Chrome, Chrome OS and Android to just name a few - as for his superlative people skills and calm approach to innovation and creativity. Yet, the company's decision to restructure its product lines and Pichai's appointment as the head of a leaner, more focused Google, has raised inevitable questions: What does Pichai's role indicate for the future of the tech giant? Will Google consolidate its position for existing products or will they focus on creating new ones? And will Pichai transform the organization that Page and Brinn created and led, or confirm the belief of a minority of naysayers that he is not yet ready for this daunting role? Pichai: The Future of Google examines these questions and more. 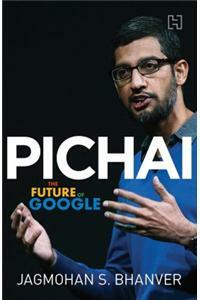 Combining reportage and analysis, it throws light on Sundar Pichai's childhood and education, his entry into the tech world and quick rise up the ranks in Google, his experience with two different leaders, Schmidt and Page, and the takeaways from the Larry Page era, and his key contributions as a leader and tech-guru to Google's most successful properties.As much a study of the organization's fascinating eco-system that allows experimentations, innovation and progress to thrive Incisive and informative, as of the person chosen to head it, this book will inspire as much as it will inform. Jagmohan S. Bhanver has worked with three of the largest banks in India, handling national and international roles. Presently, he is an executive coach to CEOs and board members of various organizations. Bhanver's seminars on leadership and motivation have had a powerful impact on several lives and careers.Bhanver is the author of two best-selling non-fiction titles and has recently finished his first novel. He has also written for several TV shows and is in the process of finalizing a movie script. This is his third book of non-fiction.